Sullivan’s Gulch was at one time a river bed, then a route for trains, and now the I-84 freeway also follows its path. For a few years part of Lloyd Golf Course lay in it bed. Most of the course was atop the south bank of Sullivan’s Gulch (up the slope on the right) but a couple of the holes, including this green under construction, were down in the gulch itself. This view is east from about 15th. Ah, cranes*, trains and automobiles. And wasn’t the old “Sweet Tibby Dunbar’s (a credit union nowadays) at 12th and Irving, the clubhouse for the golf course? Yeah…good ol’ Sweet Tibbie’s…feels like prom night all over again! I had read about the golf course in one of Kimbark McCall’s books, but I’d never seen a photo before. I didn’t know that it was actually IN the gulch! Great photo. A neighbor lived in the area around the time the freeway was built. He remembers houses being removed, an invasion of rats displaced by the construction, and a small plane that made an emergency landing on the new concrete. To be pedantic, Sullivan’s Gulch was never a river bed in the traditional sense – it was carved by the Missoula Floods. If that makes Sullivan’s Gulch a river bed, then we have to count most of the Willamette Valley as former river bed, too. 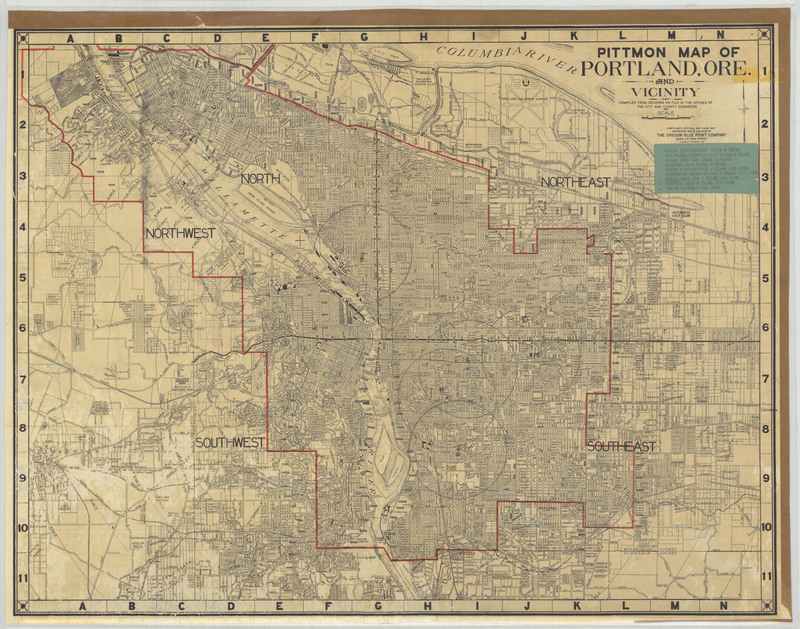 This is the first time I’ve seen a picture of the Golf course, though it shows up in this previously posted 1946 Pittmon’s map. There were a lot of fine, architecturally interesting homes in this area. It’s a shame so few of them remain. This is a great photo, Dan. It’s the first time I’ve seen the gulch pre-Banfield. I didn’t know the golf course went into the gulch, either. I’d always heard there was a “Hooverville” down there during the Depression. Someplace I have a photo of the golf course from the air, don’t recall off hand just where I got it. And yes, I believe Sweet Tibby Dunbars was the club house at one time. So, did they shift the railroad line to the north when they built the Banfield? 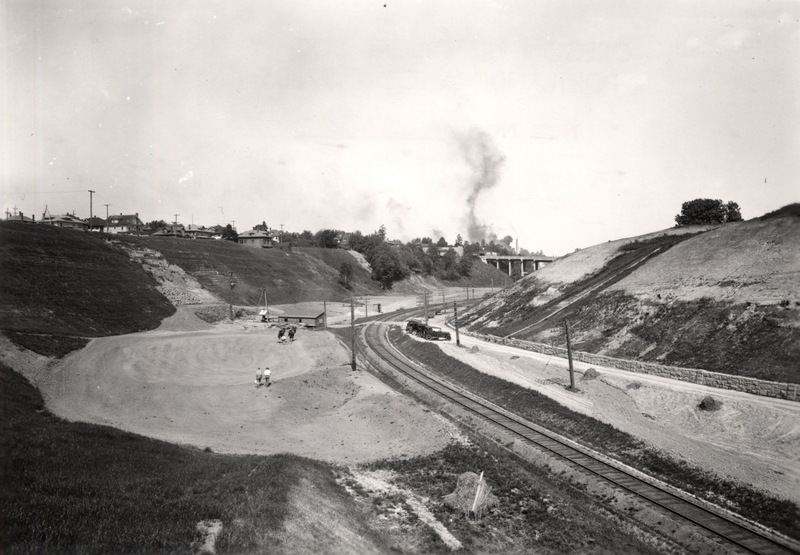 In the photo it looks like the railroad is on the south side of the gulch, where the freeway is now. The busboys at Dunbars told me there was still tile upstairs that remained from the mens locker rooms from it’s club house days. Oh wow, wow! I am about 90% sure that the house in the upper left of this photo is the one I’ve been living in the past 7 years! Have been searching for an old photo of it for at least that long. Correct me if I’m wrong, but if this was taken looking east from 15th, this would be approximately 21st Ave. where the house sits? The 20th Ave. overpass having not been built yet? I’m pretty sure that’s the 21st Ave. viaduct in the distance. I walked over it almost every school day when I was going to Central Catholic and I know there were businesses on the north end of the viaduct. One of them was a mattress factory. I wonder how one would make an approach shot to this green. Or try to make a shot out of the rough that is the ballast for the railroad tracks. Never mind, I’ll take a drop, LOL. does anyone know of a picture of the house that stood on the corner between NE 16th & 17th ave and Multnomah? It was torn down and the Holladay Park Plaza stands on that site but two of the original trees remain in the courtyard..
You can find pretty much anything in photos at the Historical Society and they charge about $8 for a print. I remember them picking up balls on the driving range using Cushman scooters with screens over them, just reach down and pick them up. now mature trees lining the streets in the now substantial business sector. I had one particular occasion to “brag” on my father’s work when I overheard one of two older ladies in the buffet line of the then Pony Soldier Restaurant or Sweet Tibbie’s(?) comment to the other that she should have seen the restaurant and property when it was Ireland’s, how gorgeous it was, how immaculate inside and out, etc. I HAD to tap the lady’s shoulder and thank her for remembering “my dad’s handiwork”.